To become a teacher, one ought to know something. Ideally, you’d know several things. In the best of all worlds, though, you would know many things — most of them, perhaps, relating to a single, broader, specific thing: physics, language, history. And even in that ideal scenario, you may still be so stupid as to get yourself fired for rank ignorance. 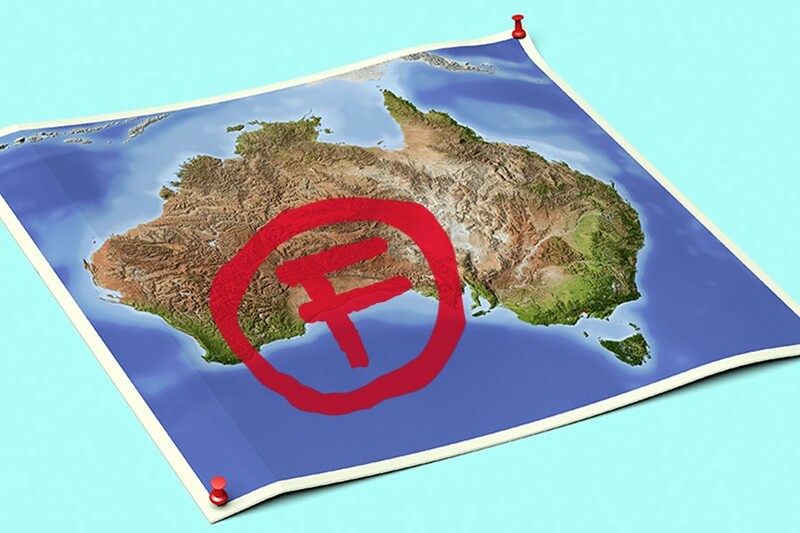 This was the case for an adjunct instructor for Southern New Hampshire University who got into a now-viral email argument with a student as to whether Australia is a country, the professor’s stubborn position being that it is, instead, a continent. (It is both.) The incident, which cost the woman her job, reminds us that a PhD in philosophy implies no real-world knowledge whatsoever, but it also makes you wonder if the professor had been parroting misinformation long ago imparted to her by an equally useless educator. My year 8 science teacher told us that the sun is at the centre of the galaxy. I got threatened with detention when I pointed out this was wrong. "We have a body and a mouth and we all know where it comes out and we have wheels and it's AMAZING what we can do!" Misapprehensions are especially alarming when they relate to the teacher’s field. We live in a world where botany professors demand that students “freeze” their seeds at 25 degrees Celsius, AP literature instructors claim that Shakespeare wrote in “Old English” (hey, they’re only about 500 years off), and developmental psych experts think that the “average IQ has gone from 85 to 120 since the 1950s.” Once, my buddy Steve says, “I had to prove to my AP US History teacher that ‘Congress’ included both the Senate and House of Representatives, and wasn’t just a synonym for the House, to get 2 points on a test that he erroneously deducted.” Also, you can lead an astronomy lab without ever taking an astronomy class yourself. In fairness, that lab sounds pretty great. he was a physics major, and after he graduated he started teaching at the school, and they had him running astronomy labs. i remain furious at how much i owe that school for my education. In kindergarten: we were brainstorming different words that started with each letter. For "H" I suggested "hour". The teacher gave me A Look and did A Scoff, then announced to the class that "silent letters don't count." World Literature 101 taught by tenured prof who had helped found the school's English program. We were assigned to read the Quran. As "background info" we're given a printout titled "Islam" FROM WIKIPEDIA. It's the mid-2000s… the article is islamaphobic from start to finish. Finally, we come to the teachers so strange that it’s hard to tell exactly what their problem is. A few are surely lazy, like the Justice and Public Policy professor who would “screen episodes of Law and Order” and “had us watch the Sharon Stone leg-crossing scene in Basic Instinct in order to ‘learn how a police interrogation worked,’” or the med school histology prof who couldn’t “write proper questions or give us microscope slides so for a midterm, so he just gave us an essay question: ‘Blood, the wheel of life — discuss.’” The latter has a potential mentee in the middle school bio teacher who, to explain animal muscle structure, “had us look through a microscope at a slice of bologna.” I’m genuinely worried about the college prof who’s “afraid of electricity,” and the National Book Award winner who turned a scene about a pair of wolves from a Cormac McCarthy novel “into a thinly veiled speech of support for traditional marriage,” and the playwriting lecturer who can only reply “But who’s the ANTAGONIST? ?” to every idea. Of course, nothing can top the journalism professor who somberly told a group of 50 students, to awed gasps, that her father died on 9/11, adding only after a hushed pause that this was in Florida, where he was killed by…an alligator. We may never understand why teachers say this stuff. You might speculate that a particular derangement comes along with a podium, or the attention of an entire lecture hall. Some get tenure, or close to their pension, and simply coast into the twilight of their career, unconcerned with pedagogy. The takeaway, in any event, is that nobody knows everything — and a large contingent of professors don’t care to know. If they want to ridicule their students’ gaffes, they should take stock, too. And here endeth the lesson.